LibreOffice is a free open source cross-platform productivity suite with features and functionality resembling Microsoft Office. A standard download of the latest LibreOffice version (http://www.libreoffice.org/download) installs an integrated suite of tools consisting of Writer (word processing), Calc (spreadsheet), Impress (presentation), Draw (drawing), Base (Database), and Math (for math symbols and formulae). The Windows version installs on systems running Windows XP SP2 through Windows 10, requiring up to 1.5 GB available hard disk space. The Macintosh version requires OS X Mountain Lion (10.8) or later, and up to 800 MB hard disk space. Both systems also need Java for LibreOffice Base. At launch (or when no LibreOffice document is open), viewers see the Start Center, enabling them to create a new document of a specific type (text, spreadsheet, presentation, etc. ), open an existing document, view a recently opened file, or choose a time-saving project template to get started with pre-formatted layout, type size, typestyle, and graphic inserts. There are several templates for correspondence, business cards, and presentations. Templates may be edited to customize them. Additional templates may be downloaded from http://templates.libreoffice.org/template-center. Choices include templates for calendars, certificates, ebooks, invoices, budgets, résumés, genealogies, timesheets, graph paper, and more. The File menu in each application has a Wizard with options to create a Letter, Fax, Presentation, Web Page, and Agenda (see below). An online Help file provides instructions for program features. Wizards take you step-by-step through page design, providing assistance as you go and opening the document for viewing once it is complete. The new document contains several placeholders for text and other relevant information. Other LibreOffice Wizards will help you convert legacy format Office document to the Open Document format supported by LibreOffice. The Wizards also help you access address book data already present in your browser, email client, Outlook address box or other external data source. You can use a Wizard in the Writer document to create a mail merge letter using addresses from your Address Book. Be sure to cull your address book before creating a mail merge document. There is also a wizard to help you create tables and queries in Base. Each release of LibreOffice offers enhancements and fixes for bugs left over from the prior version. LibreOffice 5, for example comes in a 64-bit version for Windows. Version 5 also preserves Word’s text highlighting and shading. This support extends in both directions, i.e., preserving highlights on importing Word documents, and saving LibreOffice documents with highlights recognized by Microsoft Word on import. Additionally, the latest version of LibreOffice lets you use the mouse to drag and drop images into an open Writer document or crop Writer images. Button-rich toolbars offer more icons than the previous version. For example, in Calc there’s a Formatting toolbar button to set selected row or column cells for Wrap Text. You can modify existing Toolbars or create new ones using the Tools/Customize option. Menus can be altered as well. Table users will appreciate being able to insert rows and columns in a table before the current cursor position by right-clicking and selecting the appropriate choice from the pop-up context menu. The number of rows or columns you insert in the table will depend on the number of preselected rows or columns. An Export as PDF option (in the File menu of most applications) lets you save a document in PDF format, complete with optional watermark and embedded bookmarks. Calc now offers enhanced support for conditional formatting. Other suite enhancements and bug fixes are listed at https://www.libreoffice.org/download/release-notes/. LibreOffice makes sound budget “cents” for schools and districts, delivering bang for the budget dollar because of savings on Microsoft licenses. Educators and students can produce Microsoft Office compatible files without the expense of purchasing the Office suite for home use. The LibreOffice suite does a good job of creating and saving word-processed documents, spreadsheets (complete with charts), and electronic slideshows. While this version is the most robust of any previous LibreOffice release, it is still not bug free. I experienced problems with the spreadsheet’s new conditional formatting feature (it wasn’t as automated as I expected). Similarly, Emoji graphical characters appear to be missing for in-word AutoCorrect replacements (Tools/AutoCorrect Options/Replace). Finally, Writer would not import a document created in the latest version of Apple Pages. An error message stated the file was corrupt and therefore could not be opened, even though the file opened just fine in Pages. For the price, this suite of productivity tools can’t be beat. Users familiar with Microsoft Office will appreciate how much LibreOffice programs resemble their Microsoft counterparts both in look and tool set. LibreOffice 5 earns top scores for its versatile feature set and its ability to import/export a large number of different file types. I use LibreOffice at home on a Macintosh to work on Central Office documents created in Word for Windows and formatted in Landscape mode for Multiple Pages/2 Pages per sheet. Office 2011 for Macintosh cannot convert the two pages per sheet document into a regular single page 8.5” by 11” document. LibreOffice for Mac can. 2. 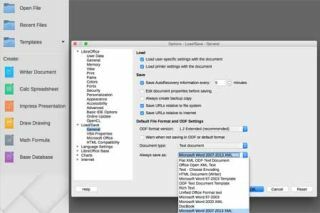 Cross-platform compatibility makes it easy to work on Macintosh, Windows, and Linux machines and still share documents. 3. Will open, read, and edit documents created in Microsoft Office, saving new files in LibreOffice or Office-compatible formats as needed. Carol S. Holzberg, PhD, cholzberg@gmail.com (Shutesbury, Massachusetts) is an educational technology specialist and anthropologist who writes for several publications and works as the Director of Technology for the Greenfield Public Schools (Greenfield, Massachusetts). She teaches in the Licensure program at the Collaborative for Educational Services (Northampton, MA) and the School of Education at Capella University. As an experienced online instructor, course designer, and program director, Carol is also responsible for developing and offering training programs and support for faculty and staff on technology for teaching and learning. Send comments or queries via email to: cholzberg@gmail.com.